I wanted to share these cards with you. They were from my birthday 5 card class last week. They were all very easy cards. Pretty much just straight stamping. The one with the tasty looking drink had some watercoloring with my Watercolor Wonder Crayons and an Aqua Painter. If you would like this class kit, I still have a few left. 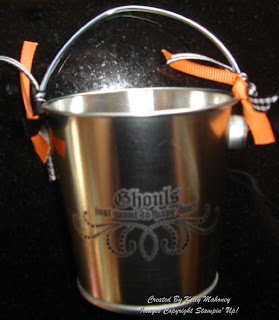 They are $15 including Shipping. Please e-mail me for more info. So far I haven't really shared many, Ok any, photos of my family. 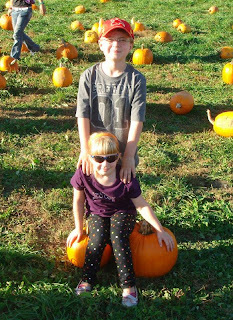 So, I thought I would share these few pics from our recent trip to Pick Pumpkins. I hope to get these scrapbooked soon, but for now the pics themselves will have to do! This first pic is my son, John, who just turned 7 and my daughter Caelen, who is about to turn 5. We have been taking pics of them like this on the pumpkins since Caelen was just a bout a year old. It is getting a little harder now that she is getting bigger. I think we are going to have to find bigger pumpkins! This next photo has also become a tradition. 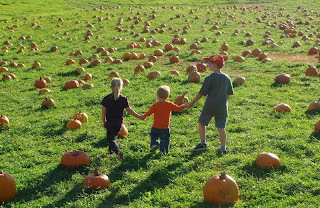 I love the pics of the kids walking through the sea of pumpkins trying to find the perfect one. This year, they even got to do it with their litte cousin AJ, who is 2. Aren't they just too cute?! So I have been keeping up with the color challenges - just not keeping up with getting them posted. So here is last week's : Pretty in Pink, Regal Rose and Old Olive. I used the new Scandinavian Season set and Wheel from the Holiday Mini. The tree is stamped on Shimmery White CS with Old Olive Craft ink and embossed with Iridescent Ice EP. I then colored it in a little with my Aqua Painter. I also added some accents with the Pretties kit. I am not sure I like the way I added the hat pin through the CS on the front.... But I didn't know how else to put it on there. This week's colors were : Creamy Caramel and Not Quite Navy. I made this very simple card using the Pocket Silhouettes and the Hugs and Wishes sets. I think this one is pretty self explanatory. I am so excited about the projects you see here. They are for my class next Wednesday, October 15th. If you live close by and would like to join us, there is still time! E-mail me right away to reserve your spot! 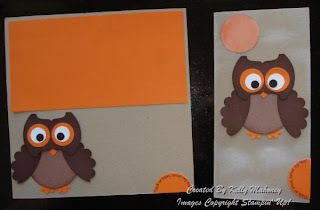 The class includes the "Batty for you" card, the little tin pail, The "Scaredy Cat" treat holder, the Peppermint Patty Spider, and either the Punchy Owl Scrapbook page or card. All of this is just $10. All you need to bring is your adhesive! And yes, for those of you who live too far away, I am offering a kit! The kit is $15 and will include all of the items you see here. The things that need to be punched or stamped will be and the card stock will all be cut for you. You will also receive step by step directions for completing all of the projects. Yopup will just need to supply the adhesive, Dimensionals, and either a 1/16" circle punch or needle for the brads on the treat holder. Shipping is also included in the $15. 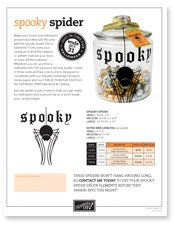 E-mail me at kelly@stampingwithkelly.com if you are interested! Here are a few more pics! Pink is this Week's Color! I hope you are having a great week! I finally had some time to play today and make this week's color challenge. In honor of Breast Cancer Awareness month and women, this week was anything Pink!! So, I went with Pink Pirouette ink and CS. 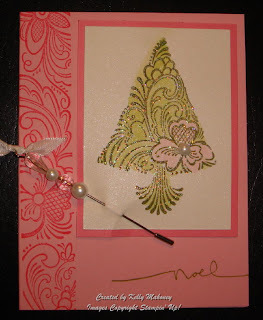 I stamped the Baroque Background stamp on Shimmery White with the Pink Pirouette ink. 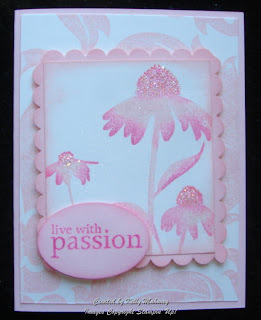 Then, I stamped the flowers from Inspired by Nature, also in Pink Pirouette. I used a dauber, directly on the stamp to add some Pink Passion highlights to the top of the flowers and bottom of the petals before stamping it on the Shimmery White cs. Then, I added some Dazzling Diamonds glitter to the tops of the flowers. 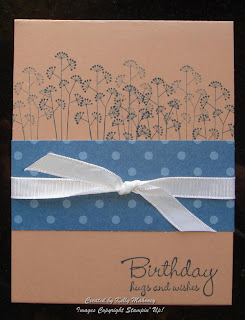 For the scallop punched layer, you need to cut your card stock 1" larger than the top layer. So my layer with the flowers is 3" x 3.5". I cut my Pink Pirouette layer to 4 x 4.5" and then punched it with the scallop edge punch. I am still working on getting the corners to look right... but you get the idea! On a personal note, this card is going to be mailed to my friend, Lisa. She was recently diagnosed with Breast Cancer and will be having surgery soon. The prognosis is good... so if you have a moment, say a little prayer or think a good thought for all those who are dealing with this disease. Let's all hope for a cure and good health for all! Ok... so I have been seeing these "Frankie's" on several blogs and I had to give them a try. I also saw this post on Carrie Rhoades' blog. I knew then that I wanted to make a few different Halloween friends. So here is what I came up with...so far. All were cut out using my Top Note Bigz die and my Big Shot. I layered them first and then cut them out. For the Mummy, I used strips of white paper and sponged the edges with So Saffron and then just the very edges with Close to Cocoa. The eyes were made with the 1 3/8", 1 1/4" and 1/4" circle punches. Frankenstein was made with Green Galore for the base and Lovely Lilac hair. The eyelids and nose are 1 1/4" circle punches and the eyes themselves are 1" circles. the "ears?" are made with Brushed Silver CS and the word window punch. Finally, Dracula was made on Lovely Lilac CS. I punched the eyes the same way as Frank's and the fangs are from the small star punch (mostly because I wanted them to be the same and this way I could get two identical pieces). Give these a try.... They were fun to make. 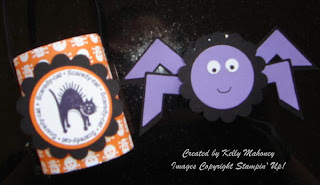 My son has instructed me to make a werewolf one too... so we will see what I can do for that. 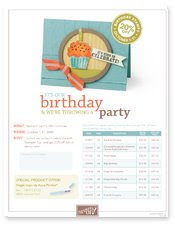 Spend $20 in regular catalog merchandise and qualify to purchase any preselected birthday/celebration stamp sets at 20 perent off. *Stamp sets are die cut. 3. The $99 Starter Kit Promo is still going on but only until October 11th. 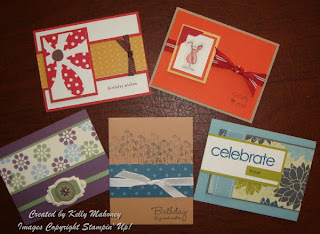 If you want to take advantage of this great time to join the Stampin' Up! Family, you need to let me know right away and I can help you get started! For more about this, see this post. This week's color challenge was a tough one for me. The colors are Rose Red, So Saffron and Orchid Opulence. For someone who loves purple, I am not a fan of Orchid Opulence! I don't use it very often at all!!!! Anyway, here is what I came up with. This first card really did not caom out as I envisioned it in my head... but I think it has grown on me throughout the day. I used the Pocket Silhouettes set. 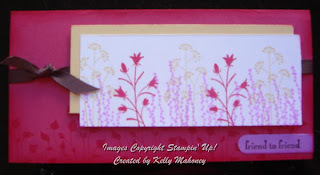 I stamped the various flowers in the three colors on the Whisper white CS. Then, I layered it with a piece of So Saffron. 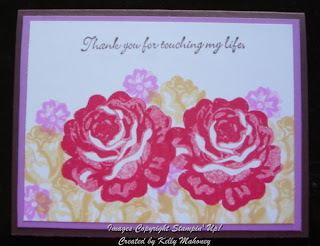 I stamped the other flower across the bottom of the card with Rose Red and then sponged around the edges of the card with Rose Red as well. I stamped the "friend to friend" in chocolate chip on Orchid Opulence and punched it out with the word window punch. 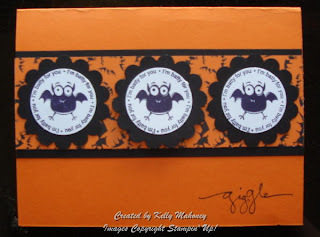 I also tied some chocolate chip grosgrain ribbon around the card. For this one, I stamped the large rose from "A Rose is a Rose" set in Rose Red ink twice. Next, I masked these by stamping them on Post-its and cutting them out. I stuck the masks over the stamped images. Then, I stamped the smaller rose in So Saffron and the small flower in Orchid Opulence. Next, I removed the mask. I stamped the sentiment in chocolate chip. Finally, I layered the main panel on Orchid Opulence and then onto a chocolate chip card. I hope you enjoyed these cards!! !